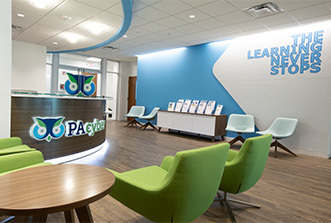 PA Cyber Charter School is one of the largest, most experienced, and most successful online public schools in the nation. They were seeking furniture solutions to further their mission and nurture their culture of inclusion. Their office features open social spaces, breakout spaces and meeting rooms. In addition to furniture, our team added experiential branding to their space highlighting their brand culture and core values including integrity, innovation, service, excellence and professionalism. Find out if you should make the switch from conventional to prefab construction!